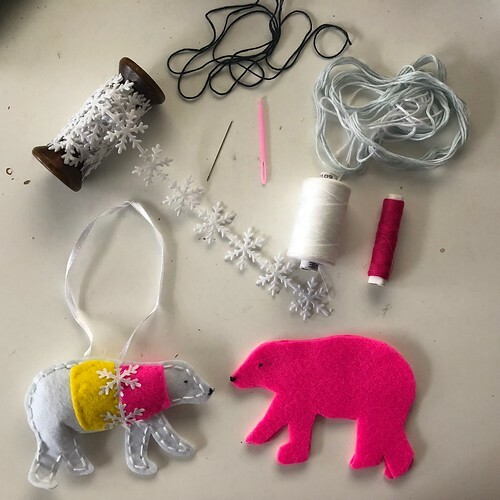 I wanted to make some felt ornaments this year to fill our Christmas tree nicely. With a two-year-old on the prowl, I’m sticking with unbreakable ornaments for a little while, so wood, metal, and felt. I saw a kit online (The Ragdoll Ragdoll in UK, Plush Addict in UK, and Vibes & Scribes in Ireland) and thought it was adorable, so I thought I’d give it a chance myself because I have way more felt than I need. 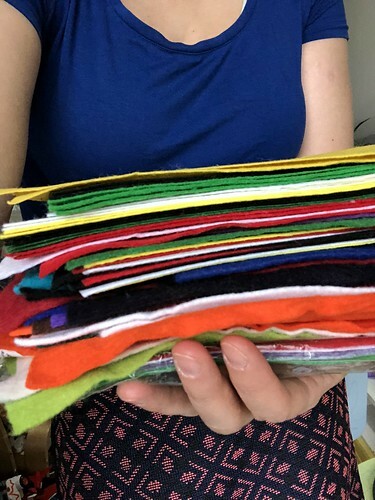 No, really, SO much felt considering I am not a felt crafter or school teacher. 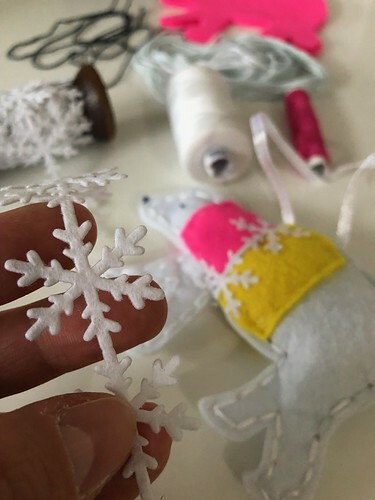 I did buy the kit too, from Vibes & Scribes, but ended up only using the white bear-shaped felt and the plastic embroidery needle because I wanted a different outfit for my guy. Here’s a proper list of the materials to make this. 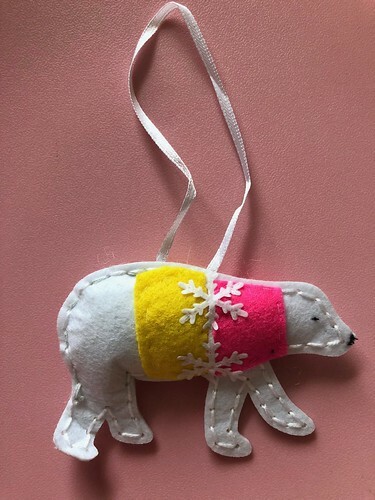 So, I decided to use hot pink and white because my tree tends to be gold, pink, yellow, and white – with a healthy dose of disco balls. I started on both at the same time. 1. Cut shape you want – do this twice. Let’s try some gold on. Oooh. Yes, I even let my craft projects play dress-up. 2. Match the two sides together. 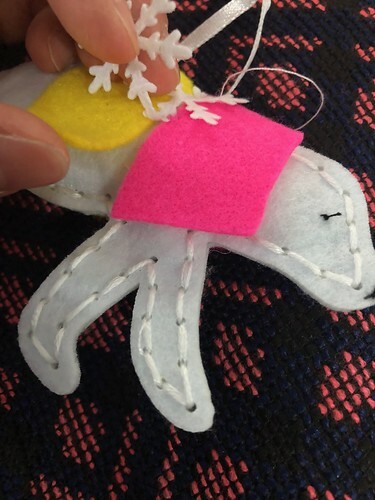 Stitch on the nose and eyes with black thread and a sewing needle. 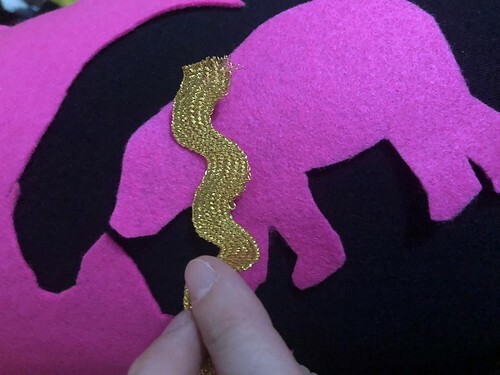 Do this with the sides together so you can sew through it. 3. 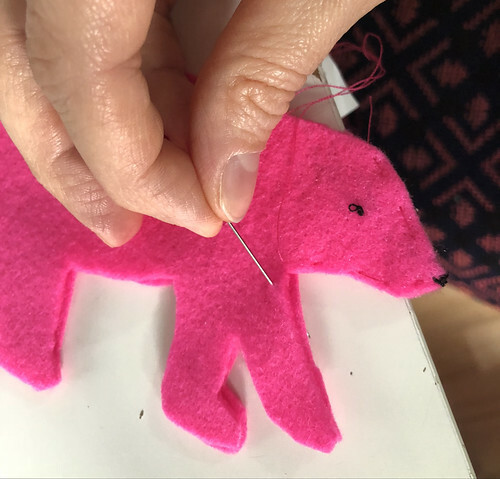 Stitch around the edges to secure the bear shape, leaving the back open to add the polyfiller. 4. Stuff the bear and seam it up completely. 5. 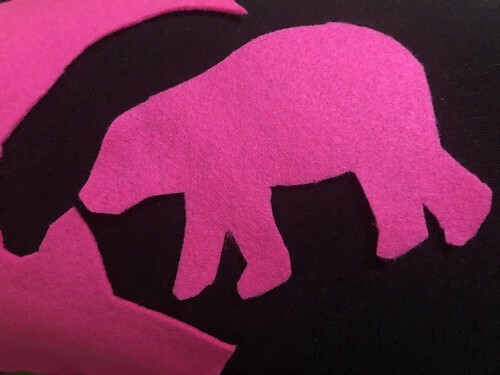 Cut out and place the felt for accents. 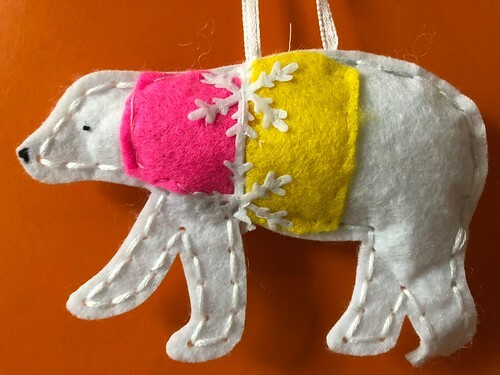 I chose a bit of pink, a bit of yellow, and a piece of snowflake ribbon. 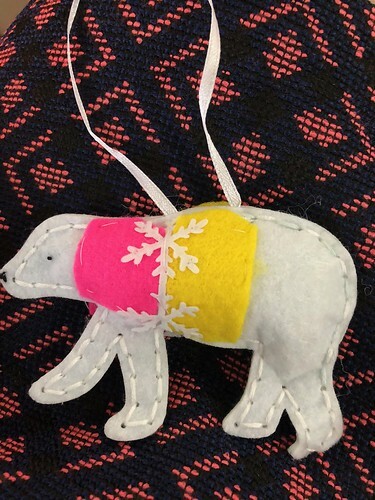 Here’s a closeup of the ribbon, which I feel really ties the bear’s outfit together. The final bear is cosy and warm. It took about an hour to make him. Not too bad. 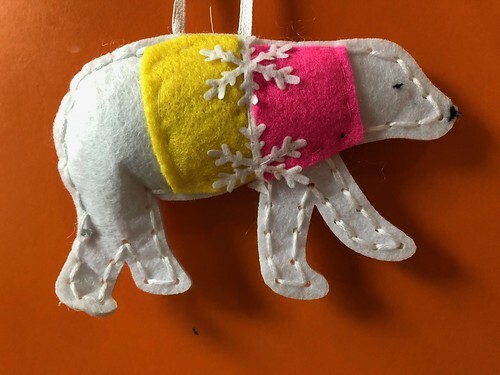 I wanted this to be a craft to do with LB (age six), but between felt-worthy scissors and sewing needle sharpness, there wasn’t much for him to do aside from supervising and helping to make creative choices. Another view because I just love him soooooo much. 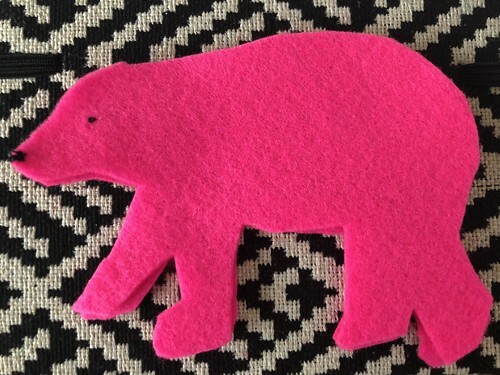 Next, I’ll make the pink bear. But I have to decide on his outfit first. 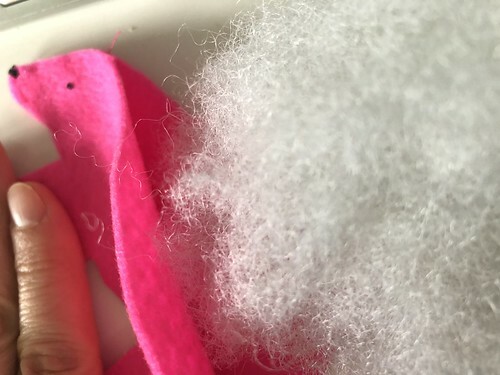 Also, though the white bear looks smaller than the pink one in this photo, the felt is the same size, but the white takes up less space once filled with the poly filling. 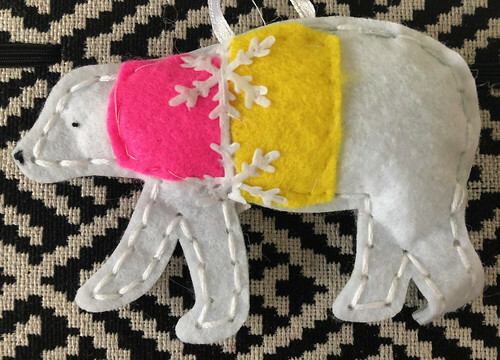 What shape or animal would you make for your tree? 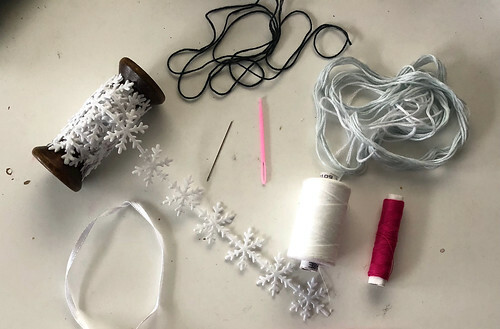 This entry was posted in Christmas Crafts, Sewing | Embroidery.